Mother’s Day subscription box worth over $160 now! 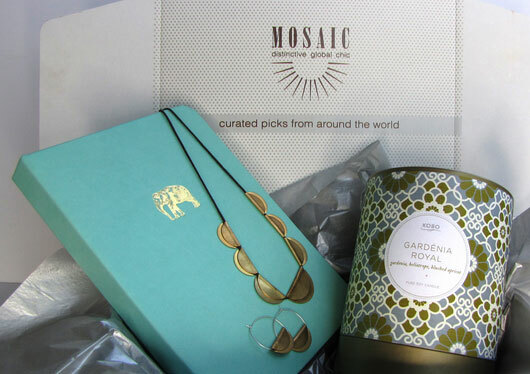 MOSAIC Box is a subscription based company that thoughtfully curates distinctively handcrafted picks from artisans and emerging brands from around the world for our subscribers, delivered every other month, right to your door. Choose the subscription option that works best for you. True to our brand, we deliver on the surprise element, connecting subscribers to the discovery of great new artisanal product. We scour vibrant, international locales in our quest to hand-pick unique items of unparalleled quality, interesting materials, and creative design just for you. We focus on the strength of a destination’s artisans and emerging talent to offer the very best in distinctive global chic. Each MOSAIC item makes a timeless fashion statement, tells a unique story and evokes the senses. Infinite possibilities across the world. Signature pieces for you, to accent your home, or to share gifts of distinction with the ones you cherish. MOSAIC mirrors your world. Chioma Amegashie has always been passionate about great product, being a student of the world through travel and global sophistication. She is a 23 year retail veteran and a product expert. A former department and specialty store buyer for top echelon national retailers including Marshall Field’s (now Macy’s), Esprit, Mervyns and Pier 1 Imports, she founded MOSAIC to fill a unique void in the marketplace-to celebrate global artistry and to give a fashion voice to talented craftsmen and women across the world. MOSAIC Box seeks to empower. 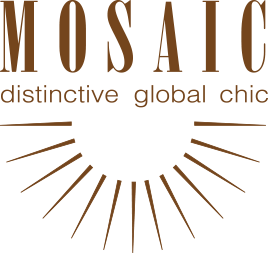 Gain access to MOSAIC‘s exclusive content, amazing product finds, and receive personal correspondence from Chioma.